A large number of Aristides de Sousa Mendes' visa recipients and descendants of visa recipients gathered to toast their freedom along with the Ambassador of Portugal to the USA, Domingos Fezas Vital, and the Consul General of Israel in New York ( @AmbDaniDayan ) and many Portuguese and American friends on Sunday, October 29th at the Museum of the Jewish Heritage, which overlooks the Statue of Liberty in New York Harbor. Families sat at tables designated by the ship that brought them or their parents and grandparents to safety in the USA during those terrible World War II years. Joan's family sailed. not to New York, but to semi-internment at Gibraltar Camp in Jamaica, BWI. This voyage marked the midway point on their 1,241 day struggle for freedom. 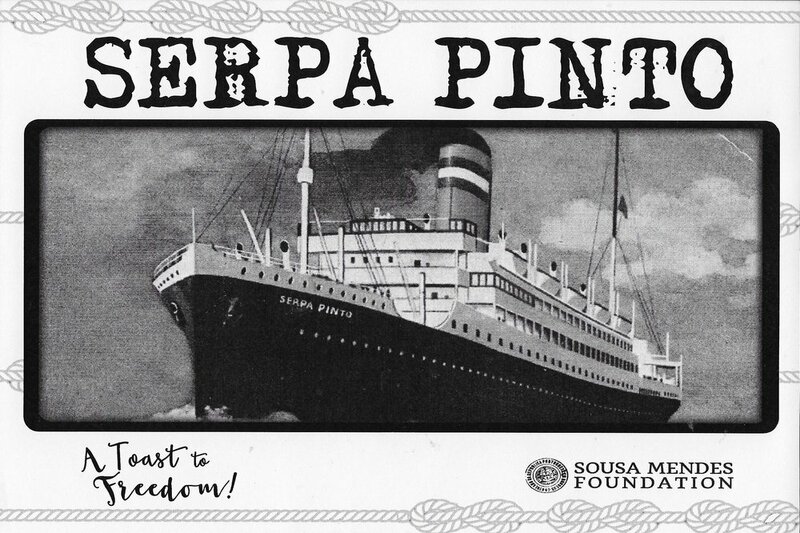 The SS Serpa Pinto made more crossings of the Atlantic during the Second World War than any other civilian vessel, leading to her being termed the Friendship vessel or Destiny ship according to Eckl, Marlen. "Review: Serpa Pinto, the Ship of Destiny". Casa Stefan Zweig.